If you don’t know about <tor.com>, it is a high quality on-line magazine of science fiction. For years they were one of the few places which would take unagented submissions for short stories, although they have recently changed that policy. They have been mostly closed to novellas as well, but they still have occasional open periods, and one has just begun. Since most submissions end in, “Try again elsewhere,” I have not previously mentioned any of my own submissions in this blog. However this opening for novellas has brought up some things I want to talk about. Again (see also 146. Novella 1). In the last few years, most people would add very short, or flash fiction, to this list. I have been working since January on a novel called Like Clockwork, but it has been fighting back. It wants to be 65,000 words long. That would be just right for a submission in the 1970s or ’80s, but is too short to sell in today’s market, unless you are self-publishing. I’m not. I have considered it seriously, but it calls for a skill set that I don’t have, and don’t want. So I continued soldiering on, hoping for inspiration. Then I became aware of the novella opening at Tor (dot) com, which left me with a choice — try to make Like Clockwork longer than it wanted to be, self-publish it at its natural length, or cut it drastically to create a novella. 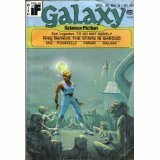 My own first publication was a novella, To Go Not Gently in Galaxy in 1978. It was roughly the first third of the novel A Fond Farewell to Dying which I was then in the process of writing. Cutting TGNG out of FFTD was easy. There was a natural break in the action that allowed me to end the story without leaving the reader feeling cheated. Cutting Like Clockwork down to size would be another matter; I would have to remove about a third of the book. That would be painful, but would not be a new situation. The floor under my computer is already metaphorically knee deep with good writing that didn’t fit into various novels. First I had to cut out a long section that took place before the main story. That was easy enough, except that it meant dribbling the necessary backstory into the rest of the book a sentence here and a paragraph there. Smoothly, you understand, and without letting the seams show. There were four main characters and four lesser characters in Like Clockwork, all paired off. One pair had to be dropped. Some of the things that they did for the plot had to be shoehorned into the lives of the remaining pairs. Smoothly; without letting the seams show. Much was lost. The Great Babbage, companion to the Great Clock, simply went away. It was reduced to a couple of off-hand references, and that really hurt. Altogether, it took me a month to chew 65,000 words down to 39,000 words. I submitted it earlier this week, retitled The Clock That Ate Time. Will you be reading it soon? The writer’s psychotic optimism says yes, but I didn’t destroy any of the files that I cut, and everything that was removed can always be restored if necessary. That’s my recent history, but it is only worth telling because it points out a larger problem. Only certain lengths of story can find a market in today’s world. There are homes for flash fiction and for short stories, and novellas can occasionally find their place, but the lengths between 40,000 words and about 90,000 words reside in a wasteland. That is really unfortunate, since most of the best novels in the history of science fiction were in that range. It’s all a matter of fashion. The best of today’s science fiction would have been rejected unread as too long to publish just a few decades ago. To put it bluntly, then and now both stink if you have a good story that is the wrong length. All this is somewhat malleable but there are stories that need to be a certain length. If you are a young writer, this profiling by story length is one more reason self publishing may be your future. This entry was posted in A Writing Life and tagged fantasy fiction, literature, memoir, science fiction, steampunk, time travel, writing on August 1, 2018 by sydlogsdon.